Here is a first for keithhirsch.com. This post marks the first time folk music has graced the home page. We’ve looked at jazz, rock, pop, blues, metal, classical, crooners, but never folk, until now. In this post, we will take a look at an early CD from the group that led to the breakthrough of oft-politically-charged folk music in the 1950s and early 1960s. That group is The Weavers, and the artists that they influenced include Peter, Paul & Mary, The Kingston Trio, and Bob Dylan. The Weavers formed in 1948 in New York, New York as a quartet comprised of Pete Seeger, Lee Hays, Ronnie Gilbert, and Fred Hellerman. They took their name, The Weavers, from a play written by Gerhart Hauptmann. Their best-known recordings are a combinations of originals and renditions and include “Kisses Sweeter Than Wine”, “Goodnight Irene”, and “House of the Rising Sun”. The CD feature here is an early compilation simply titled The Weavers Greatest Hits. It includes 25 well-known recordings culled from the studio and live recordings. Included are the three songs cited above. The compilation was released on CD in 1986 by Vanguard Records. Vanguard signed The Weavers back in 1955 after their famous first concert at Carnegie Hall, and this compilation includes recordings from that performance. 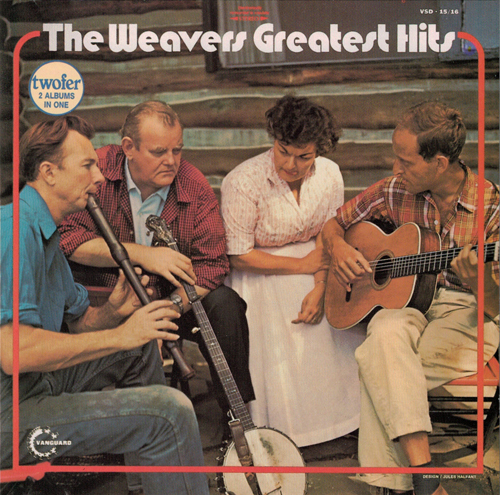 Getting back to the CD, The Weavers Greatest Hits was released under catalog number VCD-15/16. As a result of its length, the compilation was originally released as a double-LP. The cover for the single-CD release states “twofer” and “2 ALBUMS IN ONE”. The original CD of The Weavers Greatest Hits was pressed in Japan. Although the pressing plant is not revealed on the disc or inserts, the simple three-digit matrix code of “183” indicates that it was pressed at the Daio Kosan plant. The inserts are dated 1971 and 1986, with 1971 representing the original release date on vinyl, and again, 1986 being the release date for the CD. The disc is dated 1986. The booklet is stark; no song lyrics are provided. The inside of the booklet merely lists other Vanguard titles available on CD, while the back cover lists the tracks on the disc. The back insert also provides the track list. Shown below is the cover and back insert for The Weavers Greatest Hits, along with the Japanese pressing. This disc is an enjoyable listen and is highly recommended. If you are unable to locate the original Japanese pressing, fear not, as this compilation is still in print. 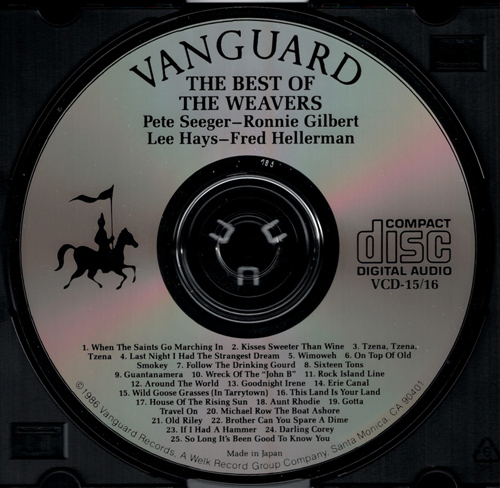 The cover for The Weavers Greatest Hits (Vanguard, catalog number VCD-15/16). Shown from left to right are Pete Seeger, Lee Hays, Ronnie Gilbert, and Fred Hellerman. This compilation fits on a single CD but was originally released as a double-LP. Note the circle in top left corner that reads “twofer” and “2 ALBUMS IN ONE”. The Vanguard logo appears in the lower left corner, and the CD catalog number is printed in the top right corner. 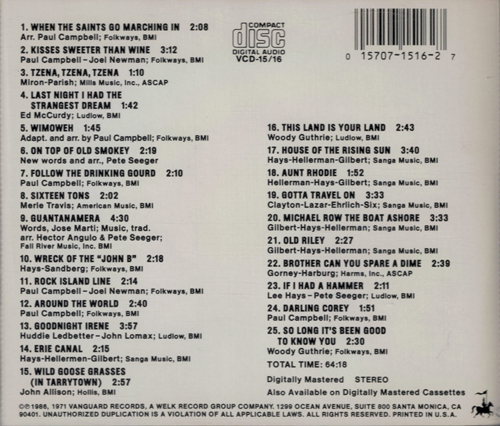 The back insert for The Weavers Greatest Hits (Vanguard, catalog number VCD-15/16). The track list is shown. The catalog number is printed beneath the CD format logo in the top center. Copyright and phonogram dates of 1986 and 1971, pertaining to the release dates for this CD and the original LP set, respectively, are printed at the bottom. The original Japanese pressing of The Weavers Greatest Hits (Vanguard, catalog number VCD-15/16). “Made in Japan” appears beneath the track list at 6 o’clock. The matrix code is “183”, which indicates that the disc was pressed by Daio Kosan.